A sustainable Sussex burger triumph! 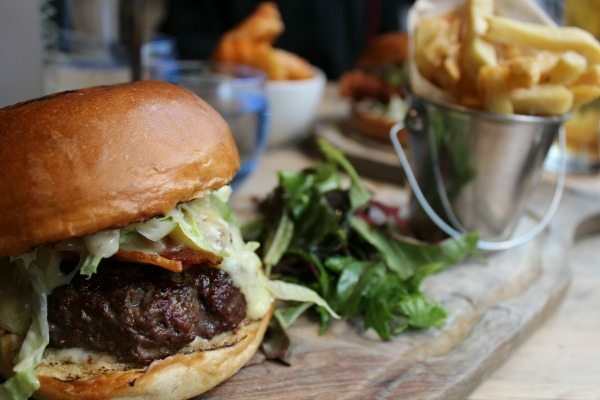 I was delighted to be asked to attend Coggings & Co for a burger review. Being one of Brighton’s leading burger establishments, I am ashamed to say this is my first visit. 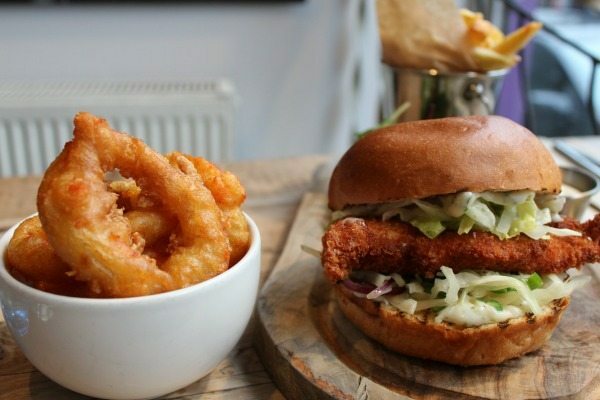 In a city that is becoming known for a fantastic array of burgers, Coggings & Co won the best burger in the 2015 Brighton & Hove Food and Drink Awards, a fantastic achievement. Many friends have raved about them and finally I get to venture through their front doors. It is raining on a Wednesday evening and Lucy is running a little late from work so I walk in to the restaurant on my own and I am quickly greeted by the lovely waitress who gives me a choice of either window seat. This is a real treat as the natural light in the restaurant is great and a window seat on a rainy evening somehow makes you feel warm, seeing the rain outside but snug inside, who thought that summer was here? 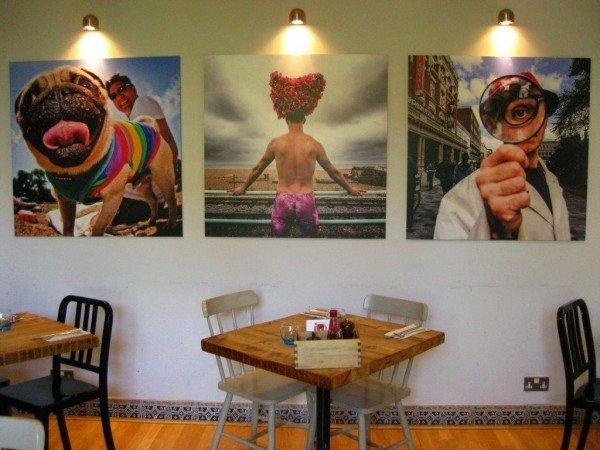 The brickwork walls add a nice trendy feeling without being in-your-face like so many new restaurants; the quirky pictures on the wall allow my eyes to wander until Lucy walks through the door. The waitress takes our drink orders and, after long day at work, Lucy orders a large white wine. 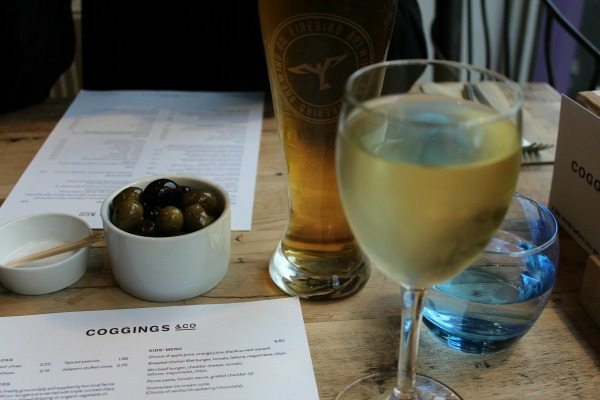 The waitress points out the Verdejo/Sauvignon Blanc which Lucy chooses is a great choice. I personally love the fact that the beers are local and from Sussex, much like the produce as well. 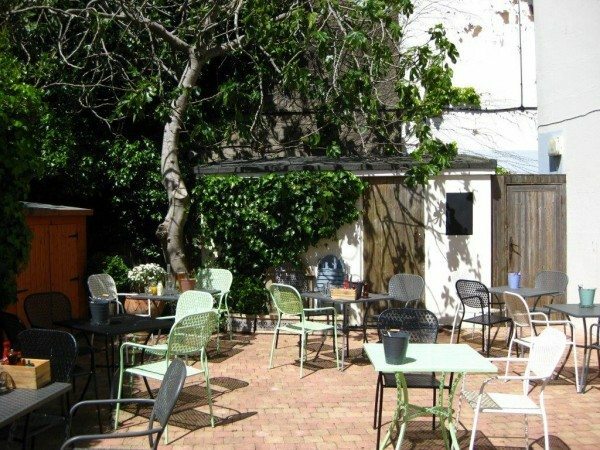 Supporting the area and using the wonderful produce that we have is great to see; I go for a pint of the Firebird Bohemia Pilsner. As we are doing a burger review, we agree to order different burgers and share, much to Lucy’s delight. As the drinks are brought over the waitress also offers us more water. The blue glasses used look great against the wooden condiment box and table; these finer touches add to the appeal of this established eatery. Lucy is enjoying her wine, she says it is lovely and I suspect also work may have been hard today as it is going down easily. My Pilsner has a wonderful mild bitterness with the hoppy taste you want from a good beer. They also serve an array of great English Ales to serve all palettes and it is clear that they certainly look after their beers here. Whilst choosing our burgers we treat ourselves to some olives which again are from a local provider. Olives with the stone are the best and these do not disappoint, nice and juicy and are really building my appetite. As this is a burger review we decide to stick with the classics so I order a Monterey Jack cheese, dry cured honey glazed streaky bacon, mustard mayonnaise burger. 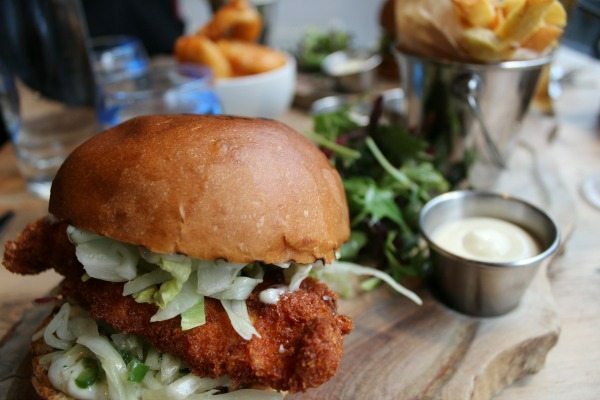 Lucy orders an alternative to the beef patty and goes for the Chicken breast in panko breadcrumbs, green chilli slaw, garlic mayonnaise burger. Before Lucy can jump in I order both sets of fries which come with the burger to be cooked in the beef dripping, for those vegetarians they also offer to be cooked in organic vegetable oil as well. Please note the chips are triple cooked as well! Of course as onion rings are on the sides menu I add these to the order as well. Now if we were not doing a burger review I would have perhaps gone for something a little different and chosen the beef, scotch bonnet chilli sauce, mango salsa, and provolone cheese burger. The waitress advises this is her favourite and that I must try this next time. 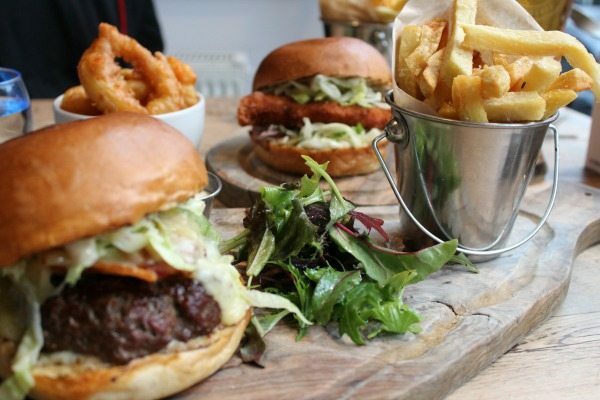 Coggings & Co. offer a special burger on the board as well so make sure you have a look. They work with seasonal produce too, so this will change regularly, which is another sign of a restaurant working with local produce. I have not even had a bite of a burger and I already love this place. The burgers are brought to the table with a beaming smile from the staff. Both burgers look immense; the toasted grill marks on the top of the buns add a bit of style and the wooden boards which the burgers are served on fits well with the style of the décor. The buns are from the Sussex bread company who are another local supplier. It is great to see that the restaurant support and promote these local businesses and the staff know all about the produce. The chicken breast is moist and the panko breadcrumbs add a great crunch and texture to the burger. The chilli slaw is not overly spicy and delicately adds a little warmth against the creamy garlic mayo. The bun holds together and as the sauce drips between the fingers this is not overly messy like so many burgers that just fall apart. Forget KFC why would you bother wasting your money on something so inadequate when a real chicken burger offers so much flavour and tenderness. Coggings & Co have already exceeded expectations and I have yet to dive in to my cheese and bacon burger. The first bite of the beef burger is amazing and the texture of patty is great. It is firm yet still moist and it is seasoned to perfection. 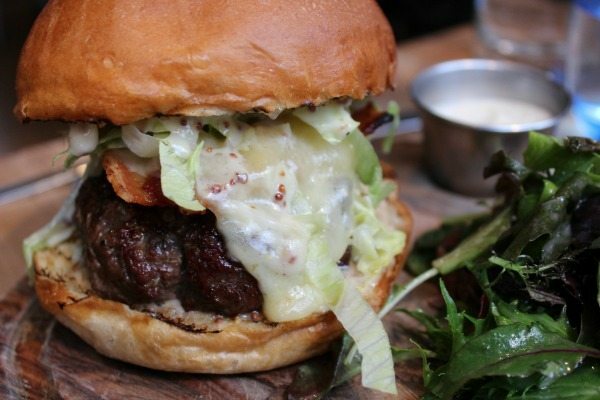 The bacon is thickly cut, crispy and smoky, the Monterey Jack cheese is creamy yet mild. Add the mustard mayonnaise and this just brings everything together to make a superb burger. This is a classic burger made with absolute class and attention. It is an absolute testament to the great burger menu offered by Coggings & Co. The burger experience is amazing but I must not forget those amazing triple cooked chips and onion rings. The beef dripping just crisps them up an absolute dream, served with a great little mayo and topped with rosemary sea salt, these chips are why you eat out. They are certainly better than what you can cook at home! We are lucky enough to try the scotch bonnet sauce that goes with the chilli burger which is fiery but not overwhelming and the waitress has sold me on that burger for my next visit. The beer batter on the onion rings is light and crispy, not greasy at all, you can taste the sweetness of the onion and have that great crunchy bite to them. As a whole, this meal is a triumph. 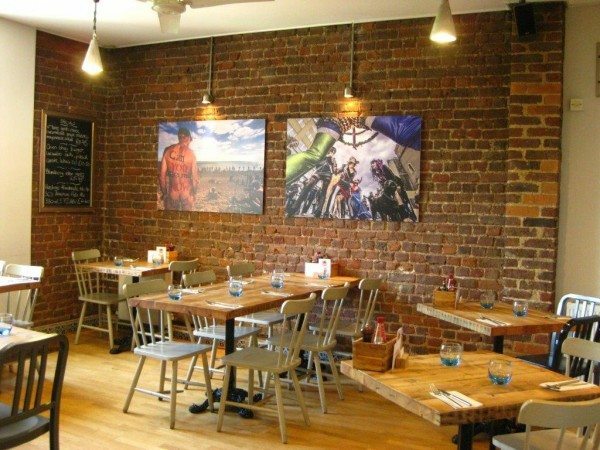 The staff are great, the venue is inviting and the food is seriously good. I have nothing but praise for Coggings & Co, the great way they use local produce to create a fantastic dining experience is the reason you’ll return again and again. In my eyes, they definitely deserved the award for ‘Best Burger’ in 2015 and simply put they are a taste sensation. See you soon Coggings & Co!